In our restaurant, we constantly hand out flyers to our customers and I wanted to share with you some of the most effective restaurant flyer ideas we have used so far. If you have read any of our other posts you should know that we are huge fans of restaurants offering catering services. Flyers are great way to let your current customers know that you offer catering. The reason we like to promote catering is because the average ticket is so much higher than the average ticket of your dining room sale. If your average catering packages serves 20 people it might sell for $200 or $250 where your average ticket in the dining room will only be a fraction of that. Sure, in the beginning you might not sell a ton but you don’t need as many to have the same effect on sales. If your average ticket in the dining room is $20 you would need 10 customers to come in to make the same sale as one catering order. As your catering operation grows, you might find yourself selling 1-5 of these $200 packages a day! This is where you will really start to see the benefit of offering catering. With flyers it is easy to catch people when they are already in the buying process. You can offer a summer picnic packages and then turn around in September and offer tailgate packages for football season. November and December come around, offer holiday meal packs. These are just a few of many reason why your customers may want to order catering and this is why we suggest always promoting catering on your marketing materials. Flyers are a great way to push out coupons to your customers. Coupons may or may not make sense for your restaurant. We worked hard to get away from them for a couple years but let’s face it, everyone once in a while you could use a nice bump in traffic. It doesn’t have to be a large coupon however, the larger the offer the better the response. If you are just starting to offer catering services, a coupon for free dessert would also be a great way to entice your customers to give one of your new packages a try. The great thing about these restaurant flyer ideas, is that once you designing them yourself, you can test an unlimited number of coupons and see what kind of response you get. I would suggest offering ‘value added’ coupons instead of heavy discounts. This might attract more bargain shoppers which is not the type of customer you want. If you do decide to offer a discount, we have seen better results by offering ‘$$ off’ vs. ‘% discount’. I think restaurant customers see more value in knowing exactly how much money is discounted instead of having to do the math themselves. Promoting your limited time offers on your restaurant flyer is another great use of space. Limited time offers are a great way to drive traffic instead of using coupons or discounts. Especially if you have a great chef in the back, I’m sure you customers will love to see what they can create! We usually test different types of specials to see what kind of response we get (the best part of taking control of your restaurant marketing!). One month we might contact our supplier and see if they have any deals or closeout specials. This is a great way to offer a high perceived value item to your customers. The next month we might offer a premium product that might not sell as many but will put more gross profit dollars in the register. A couple times a year you should definitely use a flyer to build your customer database. You can do this in a number of ways. You could do a monthly drawing for a gift certificate. Or take it one step further and offer free food for a year if you want to get a bunch of responses! This is a huge value to the customer but in reality it is only 52 plates that you can choose they can have. Maybe $200-300 over the course of a year. What if you get 1,000 names to add to your database, isn’t that worth it? You can promote different databases, maybe you just started a birthday club or a kids club. Any area of your database you would like to grow you can use these flyers to do so. This sounds simple but with all of the other restaurants out there these days competing for the same dollar, your customers may just need a reminder from time to time about what you offer. One trick I like to use is to put dashed borders around the daily specials so they look like coupons. Some of your customers will bring these in thinking they have to even though it is an all-day special. I feel like it creates more of a sense of urgency, increasing the effectiveness of the flyer. Sometimes your specials change as well so you need to let your customers know. When you find a popular daily special that works, keep that one rolling and rotate out your others to try to incrementally increase your weekly sales. We had awesome specials throughout the week but could never seem to find a good one for Thursdays so we constantly were switching that out. In reality, our customers probably just can’t eat BBQ every day! Nonetheless it is still fun to try new things and see the results. These are just a handful of effective restaurant flyer ideas. I now encourage you to go design and print a flyer tonight! These can literally be printed for pennies and you can get them in almost every customer’s hand. Sure, most of them will hit the trash but remember the marketing is a numbers game and at least they had to look at your flyer before it goes in the trash. Let me know if you have any questions further explanation of these in the comments below! Wow! Great tips. This is great advice in general. You have motivated me to look into creating flyers for my business. Thank you for the great information. 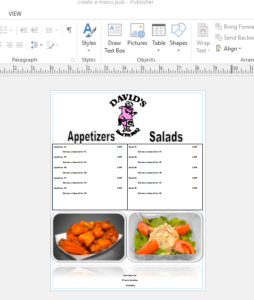 You’re welcome Rachel, it is very easy with Microsoft Publisher! A lot of interesting ideas in this text. I actually followed one of the links to realize that one does not need any extra tool for making such flyers, this is all what you already have in your computer, just a bit of creativity and this is all. So no need to pay somebody for services to do this, very clever indeed. I have a friend who needs to go through your text, he is in the same business as you. He might want to have a look into the book you are offering here. By the way, this was a pleasant surprise to see that you are using the same 20-16 theme. I have it in one of the sites I started recently and do not know all features yet, so going to check around to get some idea. Many thanks. Thanks Jovo, let you friend know the book has a lot information about catering & direct marketing techniques! Great and informative article with some constructive ideas to grow your restaurant business. I’m not a restaurant owner but I love the idea of promoting your catering side of things. It’s like running two businesses out of one kitchen. 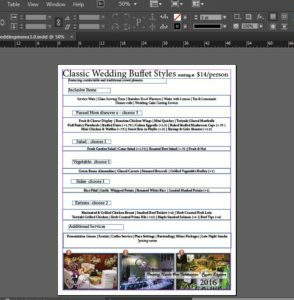 For those restaurant owners not good at designing flyer’s and don’t want to hire a graphic designer to do the job you can always use a great tool I always recommend canva. It’s free and they have great templates you can use. Hey Celeste, thank you for your kind words. You are absolutely right running catering out of the restaurant is almost like running two business which can quickly lead to some nice sales growth. But can also come with its own problems and headaches! I have never used Canva before, I started out learning how to design flyers with Publisher because they had a free trial and it was pretty easy to use. You can get the entire Microsoft Office Suite for $99/year so I feel like it is a pretty good deal. Thanks for sharing this info. We’ve actually never used flyers for our restaurant but that’s because we’re in a tourist town and most of our customers are one time visitors that live far away and never come back. With that being said I think you’ve sparked an idea in my head with this, let me know what you think of it. We’re a restaurant in a tourist town and we serve Breakfast, Lunch and Dinner. Usually breakfast is our slowest meal of the day because most of the hotels in town offer free breakfast included in the room rates. Maybe we could hand out a flyer that offers a breakfast discount so that we can convince people to come to us instead of going for the included breakfast at the hotel?? This is a great idea Robert, in fact there are several hotels in our city that we have relationships with that we leave menus and flyers with. Maybe you could reach out to some of the closest ones near your restaurant and offer to feed their staff of 10-15 people in exchange for displaying some of your flyers in the hotel. I think you are right, offering a discount to their guests could help drive traffic. If you offer catering. this could be another opportunity to developing a relationship with the hotel. Many hotels have meeting and conference rooms. If they are just offering free breakfast and don’t really have a catering department then their guests have to get food from somewhere. You could try and setup a meeting with the GM and if you present yourself well they will recommend you as a preferred caterer. This has worked well for us with a couple hotels in town. Let me know how it goes! My kids are all grown up now, they told me a funny story about I used to get flyers from Pizza Hut to see what specials were available for the week. This is a perfect example Richard, consumers are constantly looking for deals, especially families with many mouths to feed! As the restaurant owner you will definitely want your steady supply of regulars who will come in regardless of your specials but if you can drive traffic with a limited special, then hopefully you can convert some of the additional traffic to regulars. Flyers are a cheap way to get your message out. And as you pointed out, it works! Great ideas in this post, I have always been a fan of promotional flyers. Have you ever tried Vistaprint? I really like it and have used them for flyers in the past. I saw one of your other comments here was from a restaurant owner in a tourist area. Giving flyers to hotels and vacation rental owners is a very good idea. Hey, thanks for the comment Scott, yes I have tried Vistaprint before and they are a great option for printing flyers or any other printing needs. Fortunately for us, my uncle is a printer as well and his rates are hard to beat! You are right, developing relationships with local hotels or rental owners is a great way to get you flyers in the door which would then hopefully lead to more customes in the restaurant. What do you think about including your Facebook page link, Twitter username, Pinterest and/or Instagram account on your flyers? You can say for example that anyone who likes your page will get a special discount. Wouldn’t that be a great way to increase your social reach? What do you think? This is a good idea Ben, you add your social media handles on the flyer. However, I wouldn’t recommend making them too large as they could take away from your original message. It might be hard to track who lands on your and likes your page from a flyer so I would probably word it as “like our page and look out for special discounts”. Then you can regularly promote specials just for fans. I love the idea of making your specials look like coupons with perforated lines. This would definitely peak a potential clients interests as you normally associate this with cheaper prices. Is Sunday a good day to offer specials or since people are eating out anyway would that be a wasted strategy? Hey Keith, yes I love this technique. It definitely draws attention to the specials. I have always been a big believer in advertising when people are in the spending mode to maximize your efforts. If people are out and about on Sunday why not try and get them to come to your spot? We slow down in January, June and July being a college town so we scale back on advertising during those months as people aren’t going out anyway. Students go home and families are on vacation. However, during football season we crank up the advertising to get those people who are already out to come to our restaurant. An excellent coherent theme. The suggestions are wonderful and real. I provide service for a client who has a restaurant and though it is not my forte, I feel like introducing some of these ideas to them. I love to give my honest opinion on these matters, so far I am not seeing a problem with your site. Thanks for the feedback Collin. Please let your client know about our free eBook, it is filled with a bunch of information on how to introduce catering and use direct marketing to grow sales quickly. We have used these techniques for the last 4 years and have grown catering sales by over 30% each year. Catering is now over 25% of our sales and a significant source of revenue! Very well said. Flyers are a truly effective tool not only in restaurant business but also for other physical business. I personally tried using flyers in our 3D printed shirts business and the results are amazing! The sales increased drastically and more people are now buying from us. Thanks a lot for promoting this strategy in your blog. Very helpful indeed! You’re welcome! I’m glad you see the benefit of using flyers for small businesses. Whether you are a restaurant or like you said a 3D shirt printing business, flyers can help spread the word about your product and get you more sales. I’ve done a lot of direct marketing for many clients over the years but never a restaurant. Nor do I have any experience with the restaurant business. But I really agree with you that flyers can be a great tool for any restaurant. And I think it’s a brilliant idea to suggest they offer catering services, as that can obviously boost their bottom line. Flyers would be an effective and low cost way to promote that. Flyers and catering combined have contributed many dollars to our bottom line. I’m glad you see the value in this. Like you said catering can contribute large dollars at a time to the register and flyers are a cheap way to spread the word about what you have going on. An outstanding way to catch the attention of people in your locality with a flyer to catch their attention and build up sales for the catering businesses. Rather interestingly, all of this can be applied online too and catch people where they are on social media. Both facebook and twitter have those capabilities. google+ too. You could offer them a % discount coupon which they receive by email and print out in exchange for their email address, which will allow you to keep in contact with local residents and possibly regular clients. You are absolutely right Derek. We post several times a month on our facebook asking people to join our email club and when they sign up they receive a welcome email with a coupon they can use on their next order. Hello Jeremy, thank you for sharing the most creative flyer ideas. You have opened my mind to an individual issue which I never saw. I think also other people doing restaurant will find this article very useful. Even other types of business, the idea you have shared can help in the growing of the firm. What size of fliers is the most appropriate? Good question Mariam. It really depends on how much information you need to put on the flyer. I would say the two most common sizes I see are a half sheet or a third of a standard 8.5 x 11 inch sheet of paper. We usually do the 1/3 size since we can print 3 to a sheet and they are more cost effective. If you have a lot or you really want your flyer to standout you could even print a full sheet sized flyer. I enjoyed reading through your website and getting some great tips on how to build a profitable restaurant. I myself have been considering opening a small operation with my family and this site offers a lot of information that will help with promoting, how to charge for food and how to get the most out of every customer. I’d recommend this site to anyone looking to do the background information to get started on their own restaurant. the content is well displayed and you’re very knowledgeable on the subject. Well done. Thanks for the comments Joe! I’m glad you see the value in the information we write about. If you are really looking to jump start your marketing efforts and sales I encourage you to check out our eBook!